Maryland house bill 1064 has been withdrawn and the hearing scheduled for March 12, 2019 has been cancelled. View the English translation of this vlog, with video description here. View Video of the Emergency Town Hall called by NAOBI-DC which took place on March 9, 2019. The purpose of the Maryland Licensure Workgroup is to be a community-based working group who drafts the bill on interpreter licensure that would be sent to the Legislature, and is comprised of organizations and stakeholders of the sign language interpreter profession. While PCRID is responsible for its members, we also take the responsibility for every organization and stakeholder group of the sign language interpreter profession, within in Maryland and D.C., to be represented in major decisions. The intention is that Maryland's sign language interpreter licensing represents a collaboration unlike any seen in any other state with regard to interpreter licensing laws. PCRID is committed to an interpreter licensure that works. Licensing began as a conversation in the Maryland ASL community in 2009. At the time, the DC Council was considering a change in legislation concerning the needs of Deaf citizens and the licensing of interpreters became a part of that. Ultimately, that effort did not move forward. PCRID decided to establish a Legislative Affairs Committee to address future legislation regarding interpreting services in both Maryland and DC. In 2013, licensing of interpreters in Maryland received new attention as the Maryland Association of the Deaf (MDAD) was given a membership mandate to pursue licensing in the state of Maryland. PCRID requested to be a part of this process and a workgroup was formed. The bill was shelved in 2015 as a result of RID's moratorium on testing. Once RID established the Center for the Assessment of Sign Language Interpretation (CASLI), PCRID and MDAD partnered in renewing the Licensure Workgroup. View the MDAD/PCRID vlog here. Perspectives from multiple Maryland organizations and stakeholder groups were included in the drafting of the bill, and the result is a bill which has considered the needs of organizations and stakeholders, and at the same time takes lessons learned from interpreter licensure in other states that have previously embarked on state licensing efforts. In 2017, PCRID and MDAD sent the Licensure Workgroup's draft bill to the Maryland Legislature and the bill was not taken up. In 2019, MDAD approached the Maryland Legislature with a draft interpreter licensure bill, and the bill was accepted. In February of 2019, the Maryland Association of the Deaf (MDAD) sent a draft interpreter licensing bill to the Maryland Legislature and it was accepted by Delegate Pam Queen of the Economics Committee; House Bill 1064 was placed on the docket for a committee hearing. View Maryland House Bill 1064. Testimony for HB1064 would have been heard on March 12, 2019, at 1:00 PM. However, the bill was withdrawn on March 8th, and the hearing is cancelled. More details to come this year before the next legislative session in 2020. See the PCRID Community Calendar for location details. See below about how to contact us regarding questions, feedback, or any other communication. 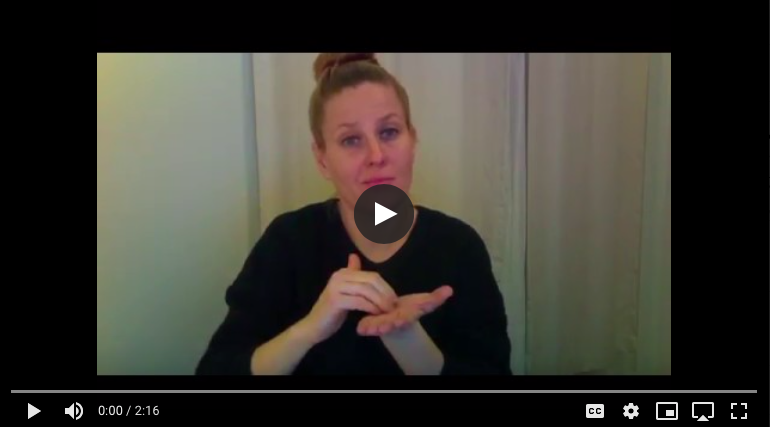 The Maryland Licensure Workgroup created this ASL video to provide a summary of HB1064. English Transcript of Video 1. English Transcript of Video 2. PCRID's summary of the Licensure Workgroup's draft bill will explain its main features and offer insight into the rationale behind those features. After extensive investigation of other states' laws, the workgroup came away with some important lessons learned that we tried to infuse into the structure of the workgroup bill. 1. Do not be too prescriptive. Other states learned, to their peril, that directly writing specifics into the bill would later require major efforts to get their state legislatures to act on revisions. For example, many states had specifically identified RID credentials, like the CI or CT, and found themselves without a path towards licensing when those tests were retired. 2. Representation matters. The states that have had the most effective paths to licensing are those that put the most effort into incorporating stakeholder perspectives. Some states found strong opposition from stakeholders after the bills were passed that lead to blanket exemptions that destroyed or diluted any effective gate-keeping mechanisms that were intended. The Legislative Affairs Committee of PCRID has been dedicated to the principle of a cross-cutting set of perspectives being included. When organizational representation from stakeholders was not possible, individuals were sought out. The Legislative Affairs Committee continues to welcome all voices, dissenting or supporting. 3. Oversight. Every state places licensing in slightly different places within the framework of their overall State Codes. Some states put licensing under their Departments of Health, a pathological approach to Deaf issues. Some states place interpreters in with stylists, plumbers, and other trade and craft professions. Still others place interpreter licensing under their state offices for the Deaf and Hard-of-Hearing. In Maryland, we approached the government and asked where to put our bill. We were advised by the Department of Labor, Licensing, and Regulation that they did not want oversight authority and that Maryland generally grants oversight authority to the subject matter experts. Doctors go under the the Department of Health. Insurance provider licenses go to the Department of Insurance. Sign Language Interpreter licensing, therefore, should go to ODHH. 4. Functionality. Several states have had issues around licensing because their Boards are attempting to do two things. They are trying to be an advisory body and they are trying to handle the administrative functions of actually issuing a license. Having a dedicated staff member to oversee the logistics of the Board is necessary. Keeping the number of seats on the Board as low as possible while still being reflective of the community prevents Boards from attempting to operate with vacant seats. One from the Maryland Advisory Council for the Deaf and Hard-of-Hearing. This is an oversight body that looks after ODHH. You may find more information on this council, its members, and duties by visiting HERE. One from the Maryland Association of the Deaf (MDAD). You may find more information on this organization by visiting HERE. One DeafBlind individual who is a member of a DeafBlind organization in the State. One from PCRID who holds a license. Two Deaf interpreters who hold a license. Two hearing interpreters who hold a license. One representative from a Maryland-based Interpreter Preparation Program. The selection must reflect the demographic and geographic diversity of the State as much as practicable. Members will serve 3-year terms and will have a staggered time-frame of rotation. Members must be residents of the State and proficient in American Sign Language. There are additional details in the bill regarding terms of service, scheduling of meetings, and steps for removal from the Board. This language reflects standard approaches to organizing an oversight Board and their logistical function. The Board has a duty to issue licenses, develop portfolio criteria, evaluate certifications for inclusion in Maryland's definition of "certified", keep a record of licensees in good standing and make that information publicly available, establish fees, determine the details of supervision, hearing grievances (investigate, examine witnesses, gather evidence, etc), and develop an online portal to accept applications, file complaints, submit documentation of requirements, and register visiting interpreters. This draft bill establishes a 3-tiered system of licensing with an option to develop specialist classes of licenses in the future. The three levels are the provisional, journeyworker, and supervisory level of license. Some criteria are common to each license (i.e. to be of good character and reputation, to pay all necessary fees, etc), but some criteria are specifically different. Each license holds a scope of work permitted. The provisional license is intended for those individuals who have passed the written examination for a certification, but have not yet taken or passed the performance exam. They may not work alone. Until June 30th, 2025 they may team with journeyworker licensees. After that date, only supervisory licensees will be allowed to oversee provisional licensees. Provisional licensees may not work in legal, medical, behavioral health or VRI settings at all. An educational interpreter with an EIPA less than 4.0 is considered a provisional licensee. Who submitted an interpreter licensing bill to Legislators in February of 2019? The Maryland Association of the Deaf (MDAD) sent two draft bills to Legislation, one being the Maryland Sign Language Interpreter Act. The incoming PCRID President met with the PCRID Legislative Affairs Committee to learn about the history and progress of the workgroup bill. 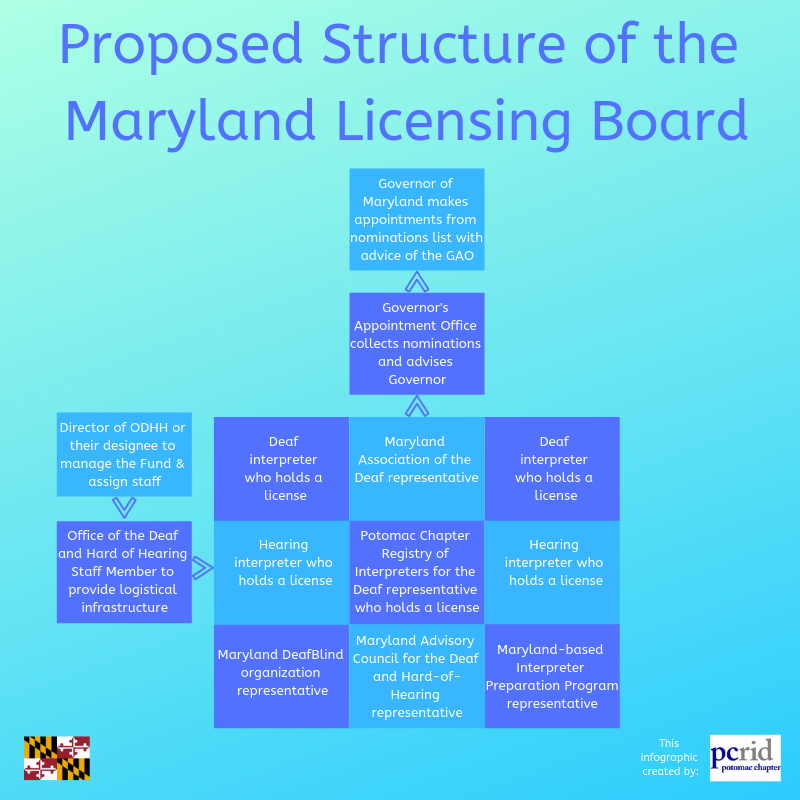 When HB1064 was accepted February 12, the PCRID President met with the MDAD President and the Licensure Workgroup chair to collaborate on interpreter licensing in Maryland. PCRID is committed to a workable sign language interpreter licensing solution. What is the difference between the Licensure Workgroup draft bill and HB1064? In 2017, the PCRID Licensure Workgroup combined in partnership with MDAD, and together, language was crafted for a draft bill on Maryland sign language interpreter licensure. In 2019, Delegate Pam Queen, of the Maryland Legislative Economics Committee, accepted a draft interpreter licensure bill brought forth by MDAD. A committee hearing was set for evidence to be presented and testimony to be given on why the bill should or should not become state law. The draft bill submitted by MDAD was converted into the form of a formal House bill and given a number, HB1064. Where is the transparency? This feels rushed! Some PCRID members may feel surprised to learn about HB1064. In collaboration, MDAD and PCRID have actively sought partnerships from affected stakeholder groups from across the State since 2009. Community town halls and member meetings have been held, and surveys have been sent out to members to gather feedback and input. As an organization of members, PCRID is committed to representing the sign language interpreters of DC and MD. PCRID has been in communication since the beginning when learning of the draft bill submission by responding to inquiries by email and on social media, and engaging in calls and discussions with members and stakeholder communities. Which certifications will the State of Maryland recognize? The language of the draft bill allows for recognizing nationally recognized certifications which allows for the inclusion of the BEI and any other certifications that may be created in the future. Will the State of Maryland accept state qualifications? State level qualifications are not nationally recognized certifications and will not be recognized in the State of Maryland. Will there be a Maryland test created specifically for Legal and Medical interpreting? In the absence of a national certification for legal, medical, mental health, or Deaf interpreters, a provision has been included to allow the Board to create criteria for portfolios that may be used to acquire additional licensing levels. No testing will be developed due to expense and oversight logistics. The bill doesn't mention Deaf interpreters. Are they covered? HB1064 has significant language issues that do appear to exclude Deaf interpreters. The draft bill has innovative language that specifically avoids any mention of auditory status. Instead we used language that focuses on the work and the languages being used by the interpreter. For example, the portfolios are not listed as being for Deaf interpreters. Rather, they identify working between signed languages, intramodal translation (visual to tactile) and intralinguistic work. This language was developed by the many Deaf interpreters involved in the working group and achieves a unique position of a bill that completely includes Deaf and hearing interpreters together all at once. This legislation establishes an enforcement mechanism that calls for a range of redress for claims to include fines and/or jail time. The exact process of enforcement will be defined by the Board in regulations promulgated by the Board. This will allow the Board to be responsive to changing circumstances and not be stymied by having to request statutory changes by the legislature. Will this license cover VRS and VRI? VRS is a federally funded and managed program and is, therefore, not covered by this legislation. Issues of interpreter quality in that area are the jurisdiction of the FCC. VRI is covered by this legislation when the either the interpreter or the call participants are located in the State of Maryland. I interpret at my church as a volunteer. Will I have to stop? No. Interpreters working without compensation in situations where interpreters are not otherwise required by law are exempt from this law. Why is the educational interpreter requirement set at EIPA 4.0? HB1064 has significant errors in describing the working environments and licensing requirements of educational interpreters. In the workgroup bill, the EIPA 4.0 level was determined after many conversations with educational interpreters and an analysis of the EIPA credentialing system. RID offers the Ed: K-12 to interpreters holding at least an EIPA 4.0 in order to be considered certified for voting purposes. The workgroup wanted to reflect that same philosophy. Interpreters in Maryland with a level below 4.0 will be awarded a provisional license and given four years to improve their score to a 4.0 or better. Are there any grandfathered groups? There are no exemptions in this bill for individuals who are working as interpreters in situations where a sign language interpreter is required by law. I am in an ITP. Can I do an internship in Maryland? Yes! Individuals who are part of a formalized internship situation may work and are not required to hold a license. Upon graduation, a license will be required. When will this law be implemented? HB1064 would go into effective October 2019, if passed by the Maryland General Assembly. Has anyone been fined for license violations in other states? There is no know mechanism for centralized reporting of infractions under state laws. Is there evidence that the quality of interpreters has improved with licensing? Evaluating quality is not feasible at this time. Using a variable such as a reduction in time from graduation to certification is a possibility, but no such analysis currently exists. On March 6, 2019, PCRID member Beth Flanigan joined the PCRID Legislative Affairs committee and will serve as the Licensure Liaison. Contact Beth with your communication on HB1064 for the committee hearing on March 12, 2019. You may contact Beth at LicensureLiaison@pcrid.org. Bio: Beth Flanigan CI, CT, has been interpreting in the DMV area since 2001. She holds a BA in Deaf Studies and is currently pursuing a masters degree. Beth spent nearly 10 years of her career operating a “boutique” interpreting agency specializing in IT and civil rights. She served on the PCRID board in 2005-2006 and currently works for the Equal Employment Opportunity Commission. It is PCRID's goal to address all communication in a timely manner. At this time we are experiencing a high volume of emails and other communication and this has caused delays in returning emails and other communication and contact. We thank you for your patience as we address all of your communication. All interpreter licensure communication goes through a process of review to get you the most accurate and up to date answer possible. We are posting answers to frequently asked questions on the PCRID website, MD Sign Language Interpreter Licensing Info Page. We thank you for your patience as we address all of your communication. For feedback on interpreter licensure, you may contact the PCRID Licensure Liaison, Beth Flanigan, at LicensureLiaison@pcrid.org. For questions regarding HB1064, you may refer to the licensure workgroup chair, Kirsi Langdon-Grigg, at mdadliaison@pcrid.org. To contact the PCRID President, Traci Ison, you may email president@pcrid.org. Visit the MD Interpreter Licensure website maintained by the Licensure Workgroup. Visit the Maryland Association of the Deaf (MDAD) website. The President of MDAD, Richard Jeffries, may be reached at president@mdad.tv. Visit the Maryland Governor's Office of the Deaf and Hard of Hearing (ODHH) website. Visit the House Bill 1064 Maryland Sign Language Interpreter Act on the Maryland General Assembly Legislation webpage.